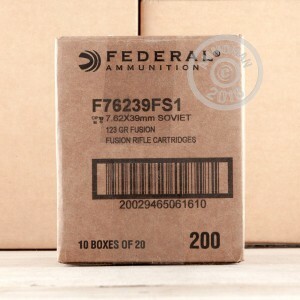 Turn your AK or SKS into a proper hunting rifle with this 7.62x39mm ammunition from Federal's Fusion series. These cartridges come in boxes of 20 and fire a 123 grain bonded-core semi-jacketed soft point bullet designed to provide maximum weight retention and optimal expansion for deer hunting. 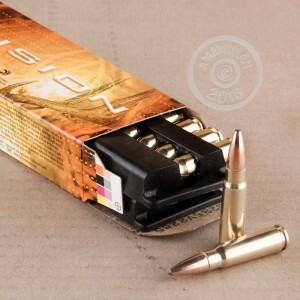 Unlike most 7.62x39mm ammunition, these cartridges use copper-jacketed bullet, non-corrosive Boxer primers, and reloadable brass cases. They are manufactured at Federal's headquarters in Anoka, Minnesota. This ammo is Spot on, Very Accurate and Hard hitting. Best I have ever seen. I am a Precision Accuracy Gunsmith. I have this accuracy out of a CUSTOM ACCURATE AR15 Platform Rifle. Don't let anyone tell you the 7.62x39 is Not Reliable I know what causes the problems with AR15 Rifles and modify that. People who assemble these rifles mostly throw parts together & expect them to shoot accurately or even expect them to function instantly. Not so... You need the proper tools, head space gauges and the ability to understand an AR15 properly! Assembled properly with quality barrels and Ammo. Then the gun runs flawlessly with no hiccups. 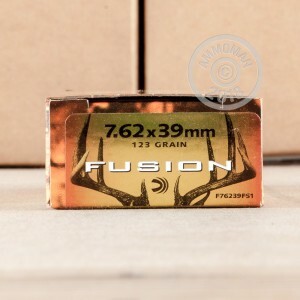 This ammo kills l Animals up to deer size game.